UPDATE | President Barack Obama signed into law on Friday legislation renaming the VA Long Beach Healthcare System after Holocaust survivor and American war hero Tibor Rubin, who used the Long Beach medical center until his death last year. The legislation, introduced by Congressman Alan Lowenthal, D-Long Beach, will rename the facility the Tibor Rubin VA Medical Center. 11/30/16 at 2:27PM | The U.S. House of Representatives yesterday unanimously passed legislation introduced by Long Beach Congressman Alan Lowenthal (CA-47) to rename the Department of Veterans Affairs Medical Center in Long Beach, California after Tibor Rubin, an American war hero who lived in Garden Grove, California until his death last year. If the Senate and president approve the bill, the medical center will be renamed the Tibor Rubin VA Medical Center. Lowenthal introduced the bill earlier this month, with support and backing from the 53-member California House Delegation, according to his office. California senators Diane Feinstein and Barbara Boxer also supported the renaming of the VA Medical Center, along with such veterans groups as the American Legion, AMVETS, DAV (Disabled American Veterans), Iraq and Afghanistan Veterans of America, Jewish War Veterans of the U.S.A. and the Veterans of Foreign Wars. Born in Hungary on June 19, 1929, Rubin barely survived 14 months in a Nazi concentration camp in Austria during World War II, where his parents and sisters died. He was eventually liberated by the U.S. Army, which inspired him to serve in the U.S. Army during the Korean War. Rubin gained a reputation for heroism during the war, as his sergeant, prejudiced against his Jewish faith, sent him on the most dangerous missions. Rubin once enabled the complete withdrawal of his fellow soldiers by solely defending a hill under an overwhelming assault by North Korean troops, according to Lowenthal’s office. 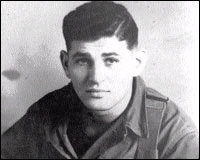 While interned as a POW, Rubin risked death and torture to sneak out of the camp and find food for his fellow soldiers. He also improvised medical techniques to perform on sick campmates, saving as many as 40 lives. Rubin received services from the Long Beach VA Medical Center before his death, committed to ideals of true patriotism. Above, left: Photo from Military.com.